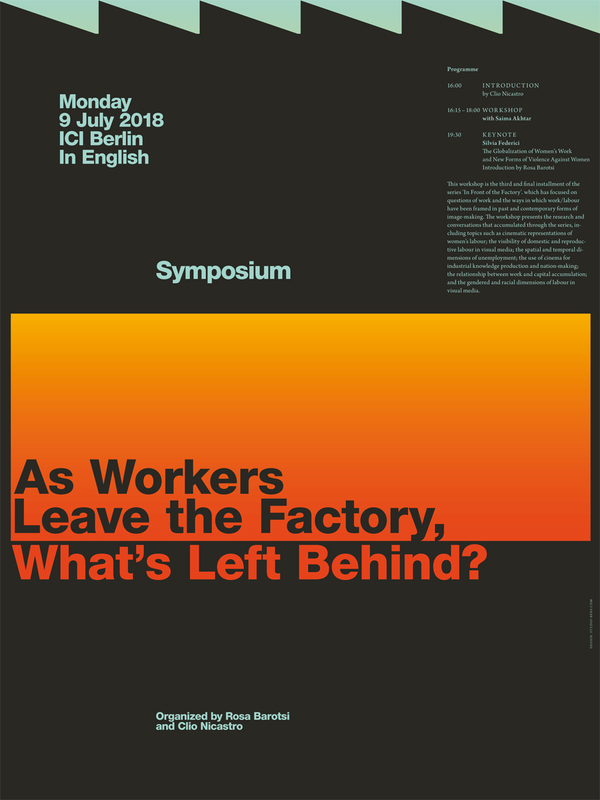 Saima Akhtar, an urban historian and co-creator of the series ‘In Front of the Factory’, will offer reflections on the advancement of new technologies and the future of work. The aim of the workshop is to foster a discussion among participants about work/labour as a primary site for capitalist accumulation and resistance, as well as the ways in which forms of image-making – particularly film – endorse or fail to support it. This workshop is the third and final installment of the series ‘In Front of the Factory,’ which has focused on questions of work and the ways in which work/labour have been framed in past and contemporary forms of image-making. The workshop presents the research and conversations that accumulated through the series, including topics such as cinematic representations of women’s labour; the presence or absence of domestic and reproductive labour in visual media; the spatial and temporal dimensions of unemployment; the use of cinema for industrial knowledge production and nation-making; and the gendered and racial dimensions of labour in film and photography. Due to a limited number of seats, this workshop requires prior registration. To register as a participant, register directly online by 30 June 2018. Details about the workshop will be distributed to participants in advance of the session.